I love making biscuits as gifts and these are so cute, perfect for mothers day and bridal showers. The base of this recipe came from the wonderful Ottolenghi cook book but I have pimped it up by adding dried roses and a rose drizzle for something a little extra. Using a pestle and mortar crush the cardamom pods and remove the shells, then grind them up as fine as possible, don't worry if you haven't got a pestle and mortar- put the pods into a bag and bash with a rolling pin. Now I used my magi mix for the next bit, you can do it by hand but its really hard work. Beat the butter, ground rice, flour, icing sugar and cardamom dust until it comes together into a firm paste/dough. Turn out onto a lightly floured board and roll into a log with your hands to a diameter thickness of about 5cm. Wrap in clingfilm and refrigerate for one hour. 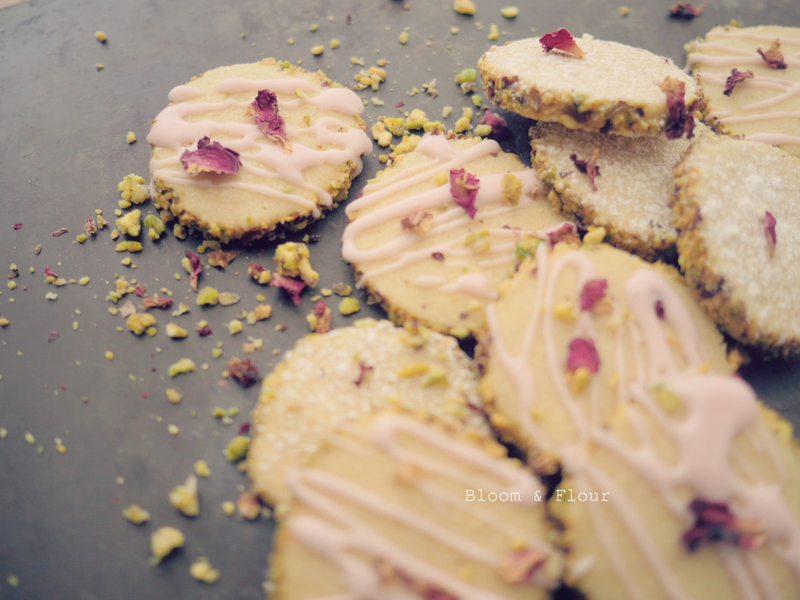 While the dough is chilling, blitz the pistachios with the rose petals until you have a medium to fine crumb. Scatter onto a flat board. Brush the log with the beaten egg and roll into the crumb mix pushing down slightly to get as much as possible covered. Wrap again in clingfilm and refrigerate for thirty mins. 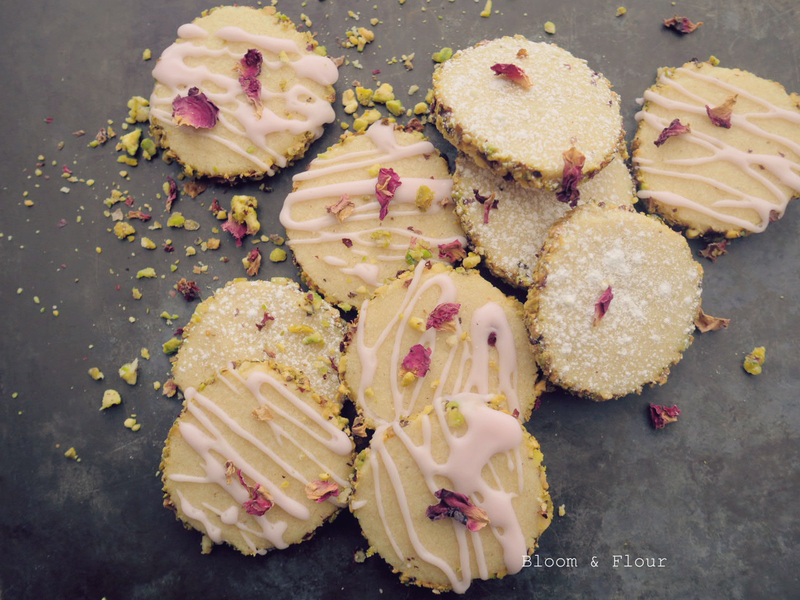 Wait for the shortbread to cool, then dust some with icing sugar and drizzle the rose icing over the rest, scatter with extra rose petals. Will keep in an airtight tin for one week. Make sure you follow my blog (see sidebar) so you don't miss out on my recipes. Oh my, even the name, is delicious!! !